Here in Greece the people on the street are fed up with politicians, all of them. A land with as much potential for growth as any is hard pressed to maintain its dignity, culture, and sense of worth. And waiting in the wings, the same sharks that bit into Greece before the economic downturn circle for the kill. 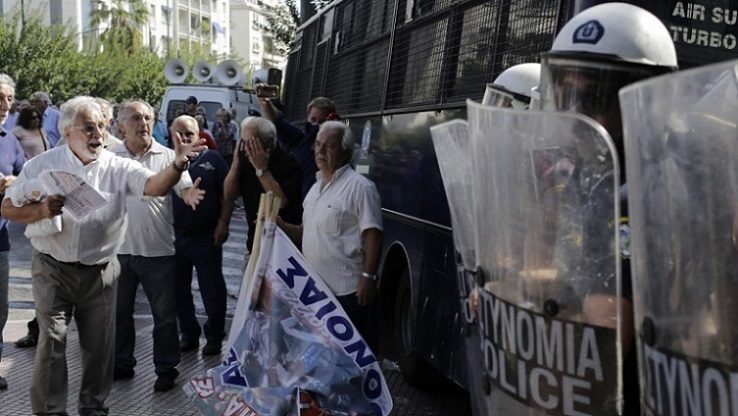 Greece is in peril, and the danger has nothing to do with unpaid bills. Greek Reporter’s Philip Chrysopoulos reflected recently this same frustration in questioning Greek Prime Minister Alexis Tsipras’ lack of continuity in getting and keeping direct foreign investment. In his scathing report, Chrysopoulos criticized the bureaucratic flip-flops over controversial mining operations being carried out by Canadian company Hellas Gold. The company employs more than 2,000 Greeks, and has been operating in Chalkidiki for over a decade. But the Tsipras administration has hog tied the company lately, requiring permit after permit. In a game of pretend environmentalism that obscures the typical Greek wheeling and dealing, Greece’s government is like a rudderless ship these days, and everyone on the street here in Heraklion, Crete knows it. I withhold my friend’s name because his is not the business of geo-politics, but his fears are echoed everywhere here. A beautiful girl with a masters degree works in a mattress shop down the street. A school director’s daughters, both honors graduates of the university here, they’re headed to Holland or Germany to seek work. A man who owned several thousand olive trees and an oil production business, he’s now giving tours of the countryside. And while almost everyone is in what Americans would call “dire straits”, every girl and lady has perfect hair and nails, perfectly tailored clothes anybody can tell are a few years old. When I look at the marble sidewalks with cracks, and at the Venetian architecture peeling away under the Cretan sun, I can only think “How prosperous were these people once.” And the betrayal is not JUST by their own kind. As someone who’s covered the crisis the last few years, few names resonate with a sour note like that of former US Ambassador Geoffrey Pyatt. With Assistant Secretary of State for European and Eurasian Affairs at the United States Department of State, Victoria Nuland, in Ukraine, he’s now stationed in Athens for God knows what mission. A holdover from the Obama administration, Pyatt is bad news for anybody who’s studied his past roles in crisis ridden countries. For a window into his mission, just reading headlines about his activities since arriving in Greece offer clues. Focusing on Greek Reporter again, a story entitled “U.S. Ambassador to Greece Geoffrey R. Pyatt Promotes Greek Recovery to American Investors” tells us where Tsipras’ orders emanate from. June 27th, Pyatt parrots the narrative of attracting investment at the 6th Greek Investment Road Show. On June 30 Tsipras pleaded with investors already burned by Greece entrepreneurship to put up more cash. The Greek people are fed up, like I said, with promises, promises, promises from their leaders and the world’s shark pit as well. Tsipras’ opposition is now refuting the PM’s claims that foreign investment is on the way. The Liberal-conservative party New Democracy is now hot on the heels of Tsipras’ Coalition of the Radical Left (Syriza), which seems a lot less radical and a lot more like a US hegemony “yes” party. On the street the people reflect less caring for party names, and big concerns over the fate of their beloved country. New Democracy’s 2015 platform promised a plan to exit the bailout and return to growth by further privatizations, along with a corporate tax rate reduction to 15 percent. From my perspective talking to people here, even the hardworking cab driver in Heraklion sees wisdom in lower taxes and a new strategy. Greeks, particularly the Crete people, are ready for some success in policy. Returning to Geoffrey Pyatt and the “American” plans, there are US interests only where Greece or any nation is concerned. “A strategically important asset that we would like to see remain in the hands of investors from a NATO country“. Pyatt also dives into the Russophobe arena talking about Russian investments in the region. Again, one of my country’s absolute spookiest hegemony henchmen throws down on “anti-Americanism, US and Europe energy interests”, and especially the Trans Adriatic Pipeline deal. Make no mistake here, Geoffrey Pyatt has no interest whatsoever in helping Greeks. His mission is to stem the flow of capital and new ideas that might free Greece from the yoke. At least this is my greatest fear and my honest assessment. The Trans Adriatic Pipeline (TAP) project (see map) is a business and geostrategic move to compete with Russian energy and growth. Pyatt, with his arrogant and simplistic talk to Greeks, gives away the reality of all the wars and crises in the region. Meanwhile, I visited an archaeological site in southern Crete the other day where the treasures of the ages are washing way because of lack of funding. Every day I look in the faces of proud, productive, and generous people pushed to the edge by the same banksters who’ve always pressed us. I am amazed by these people to be honest. If America underwent such a fleecing, the streets would have already run red. I only hope some Greek politician comes along with the courage and backing to call a halt to the highway robbery taking place in the cradle of Western Civilization. The world is on the brink of losing a fabulous treasure, the Greece that once was.